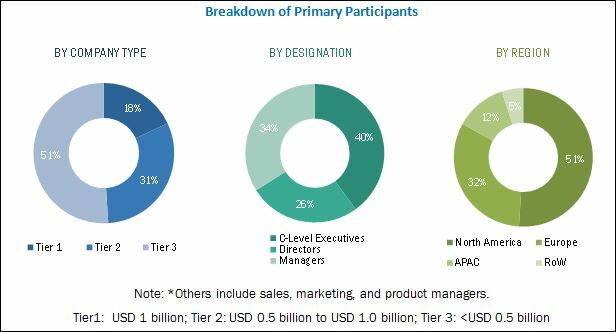 [160 Pages Report] The display controller market was valued at USD 17.26 Billion in 2015 and is estimated to reach USD 32.24 Billion by 2022, at a CAGR of 9.68% during the forecast period. The base year used for this study is 2015, and the forecast period considered is between 2016 and 2022. The research methodology used to estimate and forecast the display controller market begins with obtaining data on key vendor revenues through secondary research. Some of the secondary sources used in this research include information from various journals and databases such as IEEE journals, Factiva, Hoover’s, and OneSource. The vendor offerings have also been taken into consideration to determine the market segmentation. The bottom-up procedure has been employed to arrive at the overall size of the global market from the revenues of some of the key players in the market. After arriving at the overall market size, the total market has been split into several segments and subsegments, which have then been verified through primary research by conducting extensive interviews with people holding key positions in the industry such as CEOs, VPs, directors, and managers. The market breakdown and data triangulation procedures have been employed to complete the overall market engineering process and arrive at the exact statistics for all segments and subsegments. The breakdown of the profiles of primaries has been depicted in the figure below. 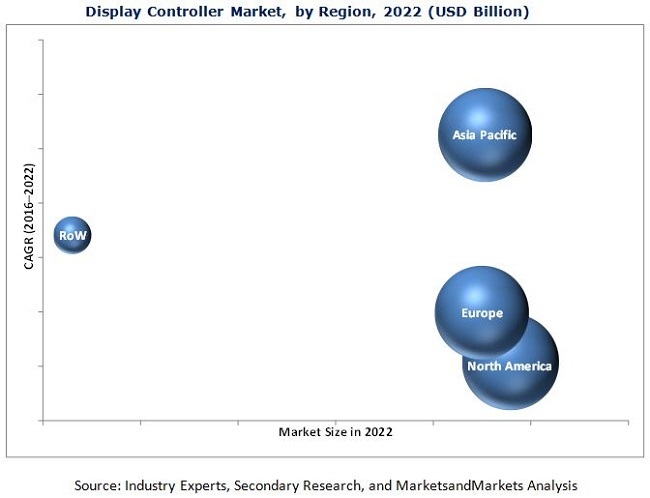 The display controller market ecosystem includes manufacturers and solutions providers for display technologies such as Samsung Electronics Co., Ltd. (South Korea), LG Display Co., Ltd. (South Korea), Texas Instruments, Inc. (U.S.), Toshiba Corporation (Japan), Novatek Microelectronics Corporation (Taiwan), Intersil Corporation (U.S.), Fujitsu Limited (Japan), and Seiko Epson Corporation (Japan), among others. In this report, the display controller market has been segmented into the following categories. The scope of this report covers the market on the basis of type, application, and geography. LCD controllers are likely to hold the largest size of the display controller market by 2022, and the market for the same is expected to grow at the highest rate between 2016 and 2022. LCD controllers are used in several high-volume applications, including smartphones, home appliances, televisions, car infotainment systems, and flat-panel displays, among others. Mobile communication devices applications accounted for the largest size of the overall display controller market in 2015. Smartphones and tablets are the key products in this segment, which account for an annual sale of over one billion units; this high volume is a major demand generator for display controllers. Moreover, the display resolution and pixel density is currently increasing in mobile communication devices, which necessitates the use of high-performance ICs with higher ASPs in these devices. North America held the largest size of the market in 2015. The demand in this region is high for major applications, including mobile communication and teleconferencing, e-learning, digital signage, advertising, and command and control. Factors such as availability of advanced technologies and abundant capital are contributing to the growth of the display controller market in North America. One of the key restraining factors for the growth of the display controller market is the lack of skilled workforce to develop software programs for multi-touch and multi-display applications. This report describes the drivers, restraints, opportunities, and challenges for the market. In addition, it analyzes the current scenario and forecasts the market till 2022. The market in this research report has been segmented on the basis of type, application, and geography. Samsung Electronics Co., Ltd. (South Korea) held the leading position in the global display controller market in 2015. The company strongly focuses on product innovations and technological advancements to capture more shares in the market. The company’s broad product portfolio, comprising a variety of semiconductors and display technologies, allows it to offer integrated products to its customers. This also helps it in obtaining better product margins, thereby improving its annual earnings. Samsung’s strong position in the market for smartphones and TVs poses as a boon for revenue generation in the market. The company relies on both organic and inorganic strategies for growth. 12.3 LG Display Co., Ltd.